Rubbing causes a ﻿transfer of electrons﻿ from one object to another. If X loses electrons, X becomes positively charged. If Y gains electrons, Y becomes negatively charged. To help you visualize this process better, you can play with the applet below. After opening the applet, make sure "Show all charges" are selected. 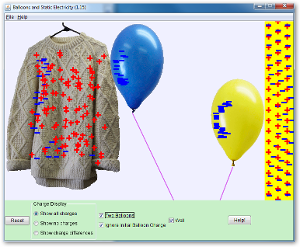 You should be able to see that the sweater and balloon are neutral with same number of positive charges and negative charges (electrons). Now, drag and rub the balloon with the sweater. You should be able to see that some electrons from the sweater are transferred to the balloon and the unpaired positive charges remains at their own positions as before (Remember only electrons can move). Thus, balloon becomes negatively charged and sweater becomes positively charged. Drag the balloon out of sweater and release. You will see the balloon is attracted towards the sweater as unlike charges attract. Now, move the balloon to the wall. You should be able to see the electrons in the wall are repelled away due to like charges repel and left behind the positive charges. Thus the negatively charged balloon is stick to the wall due to unlike charged attract. 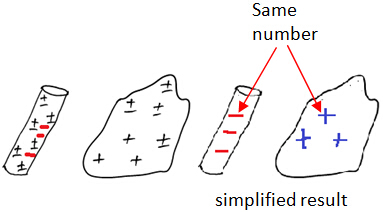 Number of electrons transferred must be same as number of positive charges left unpaired. Only some electrons (not all electrons) are transferred from one object to another object. Which object becomes positively charged or negatively charged, we don’t need to memorize. It will be stated in the question. Charging by friction is effective for insulators only, but difficult for conductors. Yet, we can still charge a conductor by this method but we have to hold the conductor with an insulator like rubber glove. Describe how the plastic becomes negatively charged and the cloth becomes positively charged after rubbing. 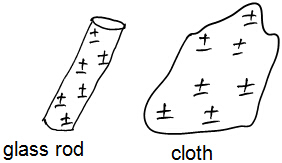 Electrons are transferred from cloth to plastic due to charging by friction.